The North Sea cycle trip took 103 days. 91 of those were cycling days. Most of the route was completed except that in Sweden I took the ferry from Gothenburg instead of continuing to Varberg. I did not cycle from Grenå to Frederikshavn in Denmark. I also did not cycle the 43km or so round the Jadenbusen (Jade Bight) in North-West Germany. I continued through Zeeland in the South of the Netherlands and along the Belgian coast. Then it was up through the South of Endland to re-join the original route near Harwich. Other than that I more or less followed all North Sea Cycle Route route signs. During the trip I recorded each day’s track using a Garmin eTrex 30 GPS. It worked well and stood up to the hot sun, any dampness and a few days of heavy rain. Battery life too was good with the Garmin providing two or three days of use on each battery charge. A Cateye MC100W odometer was also used to measure cycled distance. It also stood up well to the weather conditions. The discrepancy is due to the GPS unit measuring ferry crossings while the odometer measures actual distance cycled. The 91 days of tracks took up 21Mb of space on the eTrex 30 (out of the available 1.7 Gb) so there is plenty of space for an even longer cycle tour! The individual files do contain the sea crossings on occasions so the distance travelled and average speed would need to be taken into consideration on those days. CS in the location name stands for ‘camp site’. During some ferry crossings the elevation plummeted to minus 100m or more due to the satellite signal being lost. Please just ignore those glitches! Below are links to the GPS tracks by country for each day of cycling. You can click on each part to obtain a track, elevation and other statistics. Sophie, thanks for the question! I think a month would be enough. I left the south of Scotland on the 8th of June last year and got to the Orkney ferry on the 20th of June. I reckon 14 days with a couple of days off should do it easily! I did not race along as I prefer to stop often and take photos. As to difficulty, It is not too bad. There are a couple of steep climbs. I did little training before setting off and it took me a week or so to get really fit – perhaps a few overnight/weekend short tours fully loaded would be of benefit. Good luck on your trip – you will have fun! Just come across your website – looks a gem of info as 6 of us are planning to do the NSCR from Zeebrugge to Bergen from late April 2015. I particularly like the gps legs as those will immensely reduce our poring over maps and oil consumption, burning of at midnight! One question or two: How did you prepare you and your kit to fly to Bergen? And which airline? Mike … glad you find the GPS tracks useful! I flew to Bergen with Flybe who operated a Summer flight three times a week from Sumburgh in Shetland to Bergen in 2013. I have just checked the Flybe web site and flights are now only once a week for Summer 2015. They also fly to Kirkwall, Inverness and Aberdeen once a week as at the time or writing. For 2015, the first flights are on the 16th of May and the last on 29th of August. Best get them booked soon as the price may rocket! Flybe said that a £30 charge was to be made at check-in for the bike but mysteriously and happily I paid nothing! As for packing the bike, I took the front wheel, pedals and saddle off, rotated the handlebars 90 degrees and wrapped it all in plastic sheeting obtained free of charge from a builders merchant in Lerwick! Flybe say that some air should be let out of the tyres and the bike boxed or plastic wrapped as I did. Having said that there was another cyclist who just rocked up and loaded his bike on the plane without doing anything to pack it! My four panniers were packed in two of ‘Chinese Bags’ (available at any ‘Pound Store’). Have a great tour and let me know if you have any more questions! This is AWESOME! I am planning my trip from Amsterdam to Gothenberg. 1) Can I get onto the path in Zaandvort aan Zee? 2) I am doing this alone…do you know others who have done this? Did you go alone? 3) Is water easily accessible? Are campsites easily accessible and often? Places to restock on food? 4) In your opinion, is 40 days enough time to go from Amsterdam to Gothenberg? There are a lot of questions. Only answer what you can but I’d love to get all the info I can from you! 1) The North Sea Cycle Route passes very close to Zaandvort aan Zee so I see no problem picking up the route from there. 2) Yes, I completed the whole North Sea Route myself, and met many others doing the tour on their own. I met many other long distance cyclists heading off on their own on even longer trips! Between Amsterdam and Gothenberg you will meet many cyclists so its not a lonely trip at all! 3) Food and water are never a problem anywhere on the North Sea Cycle Route. I brought a water filter but never needed to use it! People will happily fill up your water bottle in cafes etc. There are many camp sites but on the Dutch and German sections some sites are very large holiday sites and can be quite expensive. Try and find smaller sites as they are more peaceful after a long days cycling. Food is also not a problem with small town shops and supermarkets at least once per day. 4) I took 32 days to cover the distance between Gothenburg and The Hague, so 40 days will be ideal with a few days off for resting or site seeing! I have not added any notes on the route other than the GPS data – I hope to one day. Hope that helps! Let me know how your trip goes. Have fun! I’m really keen to try the whole route! How much did the whole trip cost, roughly? Hi Matthew! I did a bit of wild camping in countries where it is permitted (Norway, Scotland) and in other countries too. The cost of camping is high for a single tourer in Germany and the Netherlands. I would budget about £200 per week on average assuming you wild camp where possible and buy your own food. It could be done cheaper of course! Depends on the level of luxuries you require on tour! Norway and Sweden up the average costs a bit as they are expensive relative to the other countries. Hope that helps! Thanks for sharing all the gps data. It is very much appreciated. I’ve been doing the NSCR in bits over the last couple of years with a friend. We’re both retired so we can take our time! We’ve done Holland, Germany and Denmark so we have Sweden and Norway in our sights for 2016. I’m guessing that you used campsites a lot from the other emails but do you know how easy / difficult it may be to charge up a battery pack? My friend now has battery assist and without being able to recharge every day we’d soon get stuck. Hi, glad you found the GPS data useful! I did quite a bit of wild camping in Scotland and Norway so I too needed a power supply for re-chargable batteries and the digital camera. I took the Powertraveller Powermonkey Extreme and charged it at campsite toilets. Unfortunately someone pinched it but on return home I have replaced it with the Powermonkey Extreme 12V that can output 12V for camera batteries as well as 5V USB. It is a rugged and waterproof battery. If you combine it with the Pixo C4 battery charger then you can re-charge AA, AAA and camera batteries using the 12V output from the Powermonkey Extreme. I would recommend another solar panel (not the 3W one included with the Powermonkey Extreme 12V) to charge the Powermonkey Extreme. The Portapow 11W hight efficiency solar panel is small and light. Just clip it to back rack while you are cycling. It works well and its not that expensive. Richard, your GPS data will be so helpful for me as I have a Garmin 800 and can easily upload your routes to Garmin Connect. 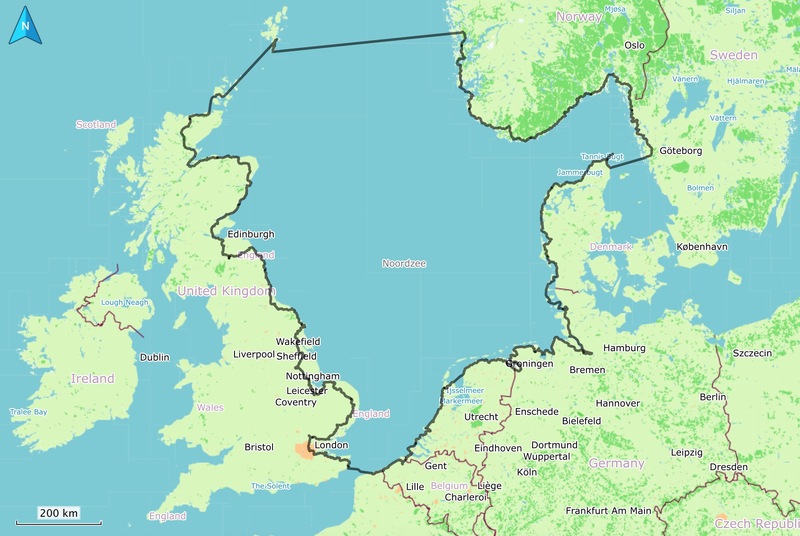 I cycled around the UK last year from and to Portsmouth (5,500 km in 80 days) so I’m keen to complete the Europe side (NSR) from Bergen and will probably finish down near St Malo France. Your camping spots will be extremely helpful as I’m playing to use camping grounds. I’m from Melbourne Australia so the logistics getting to Bergen will be challenging. Your whole web site is extremely well done and well worth a read. Thanks for your comments Malcolm. Currently south of Milan heading to Venice with more GPS data being collected! Good luck on your North Sea Cycle Route. Its really worth doing! 1- how much do you think it will cost per week on average? (i guess i don’t need any luxuries but will want to rest properly some nights). 2- I guess the best thing for me will be to buy a bike there, and some equipment. Do you have any ideas on this? What kind of bike do you think i will need? 3- How many days should it take? Do you think there are some parts that i can avoid if i run out of time? Hi Raúl – many of your questions contain an ‘it depends’ element! So I will try and answer based on my experience and my style of travel. 1 – I camped every night so that reduced costs. In Sweden and Norway, and in many parts of Denmark you can wild camp. In Denmark there are free wild camp shelters in many forests for example. Ask the locals when you get there. Here is some general info on wild camping. For living costs, Denmark and Sweden are more expensive, with Norway being the most expensive generally. With one night a week in a hostel etc, it could cost up to €250 per week. It really depends on how frugal you are! 2 – I assume you will start from Brussels if you are coming from South America. Belgium is a cycling country so you could easily find a second-hand bike there. Try and find a bicycle co-operative that repairs and sells second-hand bikes. Go for a steel frame 1990s mountain bike with no suspension. Generally the route is good so suspension is not required (and one less thing to go wrong!). Generally any commuting bike will do if it takes pannier racks. You could get some panniers before you leave and use those as luggage. Once you have a bike you can sort out some racks. If you do buy a bike at home first it may cost a lot to get it there and back depending on the airline. 3 – It took me about 40 days from Bruges in Belgium to get to the south of Norway, but I go slowly! You could do it faster as a lot of it is quite flat until you get to the north of Sweden. Also a day off a week is a good idea. Train services are good but may not always follow the route. They take bikes so no problem jumping on a train whenever you need to/want to/weather turns bad/etc. Many of the long stretches in the Netherlands and Germany on the coast are along straight dykes and a little mundane, and often windy so you could skip those bits. I recommend island hopping the island in Germany and into Denmark. This is a great post. I’d been looking for ages to try and find a map of the elevation and when I came across yours, it gave me that plus more! I was thinking of doing the section between Bruges and Haarlem (ending up in Amsterdam) but have heard a lot on the grapevine about it being particularly windy and difficult if it’s blowing in the wrong direction. Is there a different section you personally would recommend or is this section still worthwhile doing? We’re looking at about roughly 200miles cycling over the course of a week. Hi! Not sure inland but I had a few windy days along the coast. Though not many. Best get out there and see how it goes. If you head from Bruges along the canal to the coast (Zeebrugge), its quite interesting along the coast. Some long straight exposed sections along dykes. If you can, continue down to Hook of Holland. Lovely in the sand dunes there. Touring by bike is take it as it comes in my view. Too windy. Have a day off! Enjoy your trip! Norman – nope, no guide book used. The route is quite well marked and never found the need to use a guide book. There are guides available however. Hi Richard! Great info on the route, thanks for sharing. I am planning to cycle from Oslo to Bergen in a few weeks. Due to limited time in Norway, might try to cut out a 150km-250km portion and go by train. Any recommendations on which portion would be best to cut out? I imagine the whole route is great, but wondering if there might be a ‘less eventful’ portion. Any insights (if you can remember =]) would be very much appreciated. Hi! Oslo to Bergen is almost an East-West route. I travelled round the Southern coast of Norway so I am not familiar with the inland route. As far as I know there is a train between Oslo and Bergen but I am not sure about the rail services along the Norwegian coast. Sorry I cant be of more help on that one. Happy travels! Hi, Someone else who has circumnavigated the NSCR EV12 on a Thorn. Lovely to read you blog, resonates with my own journey in 2017. I also cycled from Land’s End to JOG via the Wild Atlantic Way and hope to circumnavigate The English Channel (Tour de Manche) and the Irish Sea later, although a slow tour of the Inner Hebrides appeals more. Thanks for your comment and links – will check the website!